Oman Air has officially announced that it will be placing a major wide body order for 15 aircraft in 2018 as part of a long term strategy to replace its 10 A330s as well as to cater for incremental growth. In addition, WY also revealed that it made a net loss of US$337 million in 2016 which was 50% higher than the loss made in 2015 as yields dropped plus fuel and other expenses rose. New routes being studied by the airline were revealed to be Hong Kong, Seoul, Peshawar and Johannesburg. Out of the 15 aircraft going to be ordered, 10 will be used to replace their A330 fleet whilst the remaining 5 are ear marked for network expansion. This brings the total wide body fleet count to 34 aircraft. 1. WY already has 6 B787s in its fleet with pilots, engineers and cabin crew certified on this plane type. 2. The A359 is a more expensive aircraft to purchase and operate versus a B789 plus it has approximately 15% more passenger capacity only which is not required by WY. 3. Another fleet type mix into the frame will only lead to higher costs, complexities and headaches for crew planning. 4. Why would WY want to have a dual wide body fleet mix of A350s and B787s when their B789s has the right capacity for all its high demand routes i.e. 288 seats plus it has the capability of flying all of them nonstop without payload issues including any potential future nonstop service to New York, Toronto or Australia. 5. If WY wants more capacity for its leisure/VFR routes such as MNL BKK CGK DAC INDIA JED which don't require 30 business class seats, it can easily reconfigure few of their B789s into a high density layout to have 18 business class (flat beds) + 294 economy class to seat 312 passengers. 1. 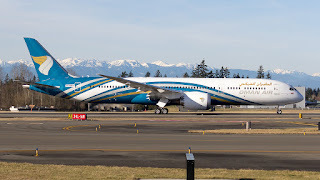 WY should have its future wide body fleet revolving around the B787-9 (789) only which will in turn lead to synergies and mega cost savings across the airline. 2. As part of an incremental order for 15 B789s, it should request Boeing to buy back the 4 B788s as the future re-sale value of this aircraft type is not looking that promising versus the more popular B789! There is also no point having a 267 seater B788 flying along side a 288 seater B789 offering only 8% more seats. 3. In this manner, the total wide body fleet count will number 30 B789s which is more than enough to meet its long term needs versus the original intention of 34 as having more wide body planes flying long haul for a GCC carrier like WY will only increase 'net losses' since fuel prices wont remain $50-$55 forever. 4. The 30 B789s can be subdivided into two configurations i.e. 20 units with 288 seats (which it currently has i.e. 30J-258Y) and the remaining 10 to be in a higher density configuration with 312 seats (18J-294Y) to serve specific high volume routes in Asia. 5. Therefore if the above gets taken into consideration, the 2020-2030 WY fleet will consist of just two airplane types only i.e. B789 + B737MAXs which is the right way to move forward.